Wednesday October 24 (Garden City, NY) – With a five-game unbeaten streak heading into Wednesday’s NJCAA Region XV Men’s Soccer Semifinals, it was going to take a lot to stop the Westchester Community College Men’s Soccer team from advancing to compete for their first-ever Region XV Championship. Unfortunately, for Westchester, their opponent on Wednesday was ‘a lot.’ What it took to bring the Westchester season to an end was the #1 team in the country as top-seeded Nassau Community College defeated the fifth-seeded Vikings 3-0 on a windy afternoon at Mitchel Field in Garden City, New York. With the loss, Westchester ends a tremendous soccer season with a 10-4-2 overall record. A game was far closer than the final score indicated as Nassau CC, the nation’s third highest scoring team, was unable to penetrate the stout Viking defense until well into the second half. Thanks to an incredible 13-save effort by freshman goalkeeper Guilherme Griza (Novo Hamburgo-RS (Brazil)/Colegio Marista Pio XII), the teams were tied 0-0 at halftime, and the score remained that way until the final 20 minutes of play. However, as they have done all season long, Nassau (16-1, 10-0 Region XV) used their quick-strike offense to put Westchester away late in the game. The Lions scored at 70:00 to take a 1-0 lead, and forcing the Vikings to press to attempt a tie. The effort provided Nassau with several late scoring opportunities, and the Lions scored in the 77th minute and 88th minute for the 3-0 final. Nassau CC advances to Saturday’s Region XV Championship Game where they will host second-seeded Suffolk Community College. The Lions and Sharks will meet for the Region XV crown for the sixth consecutive season, and eighth time since 2009. For the 2018 season, Westchester CC featured one of the best defensive teams in the nation, allowing 19 goals over 16 games. Eight of those goals scored by Nassau Community College during two games. The loss marks the end of one of the best soccer seasons in Westchester CC history. 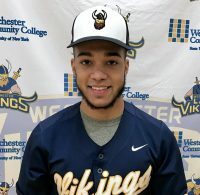 The Vikings broke the 10-win mark for the first time since 2015; spent two weeks ranked in the top-10 in the nation, and won their fourth consecutive Mid-Hudson Conference Championship under first-year Head Coach Alfio Carrabotta. With an outstanding nucleus set to return, and a full year for the coaching staff to recruit, the program is optimistic moving forward. Luis Galeano (Freshman, Rye Neck HS) was voted the MVP of the Mid-Hudson Conference. Joining Galeano on the first team All-Conference team are Franco Ladron De Guevarra (Sophomore, White Palins HS), Guilherme Griza (Freshman, Brazil) and Leonardo Vargas (Freshman, New Rochelle High School). On the second team are Jose Tovar (Freshman, Riverside HS) and Miguel Perez (Sophomore, Hendrick Hudson HS). Westchester Community College is the 2018 Mid-Hudson Conference Volleyball Champions. By any common measure, winning a conference championship is the achievement of an athletic lifetime. However, the 2018 edition of Westchester CC Women’s Volleyball achieved championship greatness by being simply uncommon. One year ago, they finished 7-13 under first-year Head Coach Taneisha Cantave. A year later and wiser, the Vikings won their seventh match long before September ended. Rockland Community College, the defending Mid-Hudson Conference Champions, briskly swept WCC to open the season on Tuesday, Sept. 11. That would prove to be the last time this year that Rockland would beat Westchester as the teams battled each other two more times. And while a seven-win season might leave many programs with more questions than answers, for WCC the punctuation became exclamation points as the Vikings left Orange CC on Tuesday night with a Championship Trophy, and a 15-7 record to go with it. For Westchester CC, Tuesday night was exhilarating. It was emotional. It was exhausting. But, it was not easy. Westchester’s Semifinal Round victory over #3 Rockland Community College was a classic in itself. Unforced errors plagued WCC during the first set as Rockland held on for a 25-21 win. Westchester rebounded to win the second set, 25-19, before falling 22-25 in the third set. The Vikings’ 25-20 win in the fourth set led to a a deciding set five where WCC left no doubt, storming out to a 7-1 lead and never looked back, winning 15-11. Sophomore Madison Young (Hartsdale, NY/Woodlands) saved arguably her best match of the 2018 season for the moment the Vikings needed it the most. She left Rockland in a position where the Hawks had no answer for her. Young finished the match with 22 kills, 5 digs, and three solo blocks … to go with an incredible .833 attack percentage, and two service aces. Sophomore Taylor Mello (Cortlandt Manor, NY/Woodlands HS) was tremendous, finishing with 10 kills, six service aces, and 4 digs, while sophomore Lindsay Leggio (Mahopac, NY/Mahopac HS) enjoyed another fine match with 36 assists, eight service aces, and four digs. The win set up the match of the year against top-seeded Orange Community College. The Colts opened play with a 25-18 win, and appeared to be in complete control when they jumped out to a 23-19 lead in the second set. However, during a season full of big rallies, the Vikings were up to the task, scoring six consecutive points for the 25-23 win to tie the match 1-1. After Orange took a 2-1 lead after a 25-19 win in the third set, Westchester rebounded to win the fourth set 25-20 to set up a winner-take-all deciding fifth set. In addition, boy was it exciting. At one point, the race to 15 points was tied 10-10. However, in the end, the resiliency displayed by WCC all season long held out, and Westchester earned their first Mid-Hudson Conference Championship since 2001 with a 15-12 win, and a wild celebration ensued. Also for the Vikings, sophomore Mello notched a double-double with 12 kills, 13 digs, and four service aces, Young registered a team-high 20 kills to go with two digs and two solo blocks, and Leggio had 38 assists to go with two kills and four digs. THURSDAY OCTOBER 25 (Garden City, NY) – When the day comes that the Westchester Community College Volleyball team is routinely the powerhouse program in Region XV and regularly competing on a national scale, they will remember the 2018 team. They will know the foundation set by a group that entered the season expecting nothing after a 7-13 record one year ago, but gaining everything by winning 15 matches, capturing their first Mid-Hudson Conference Championship since 2001, and qualifying for the Region XV Championship Tournament for the first time since 2015, and only the second time since at least 2012. If indeed Vikings Volleyball is on a journey to the top, those who achieve that height will never forget where it started. Right here. 2018. This team. Unfortunately, the 2018 volleyball season is now over after second-seeded Nassau Community College (24-11) swept Westchester Community College on Thursday night in the NJCAA Region XV Quarterfinal Round, but the Vikings left the Nassau Community College Gymnasium fully understanding the accomplishments they had achieved, and the standards they have set for all WCC volleyball teams to come. For this team, it was the end of a journey, but for the program, it was only the beginning. Nassau CC won the match 25-23, 25-15, and 25-21 to advance to the Region XV Final Four for the fifth time during the last six years, but it was a match the proved to be far more competitive than the regular-season match that took place when the teams met only eight days ago. During the first and third sets particularly, the Vikings battled Nassau point-for-point, and both sets could have gone either way. For Westchester, three two-season sophomores played in their final career match for WCC, with all three contributing tremendously to what proved to be a fiercely competitive match. Madison Young (Hartsdale, NY/Woodlands HS) had 11 kills – to break 400 career kills for Westchester – and added five digs. Lindsay Leggio (Mahopac, NY/Mahopac HS) added 21 assists – to finish with 977 career helpers. She also added four digs. Alysha Owens (Mount Vernon, NY/Mount Vernon HS) chipped in 4 kills and 11 digs. Also for Westchester CC, freshman Melody Pabon (Bronx, NY/Celia Cruz) and sophomore Taylor Mello (Cortlandt Manor, NY/Putnam Valley HS) added nine digs apiece. The Vikings finish with a 15-7 overall record, their best record since prior to the 2012 season. In fact, since 2012, no Westchester Community College Volleyball team has won more than 11 matches in a season. It was quite a run for this program … and the rise of WCC Volleyball is just getting started. SATURDAY OCTOBER 27 The NJCAA Region XV Cross Country Championship was cancelled due to the weather.